The HD-9STX is your 9,000-lb. rugged lifting solution for when you need get something heavy and high, but you don't have a lot of space on the ground. Perfect for vehicle storage and service—in the shop or garages with high ceilings. Whether you're a service professional or a DIY'er, BendPak’s got the right lift for you. This model is available with optional casters, drip-trays, jack platform and more. With more height to work with, this lift does something others do not: it fits trucks and SUVs in the lower level. This is essential for parking purposes, especially if your lower-level vehicle is too heavy for the runways. A high-rise lift also increases the comfort of techs working underneath. 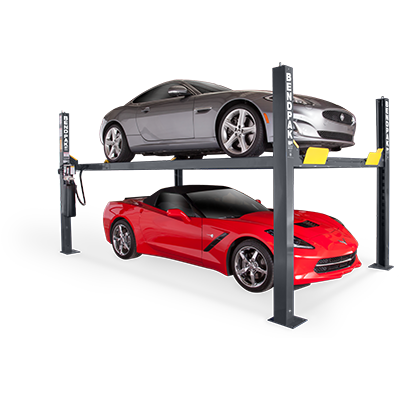 Pulling transmissions and draining oil is safer and easier on high-rise car lift. The HD-9STX eliminates stooping and awkward straining when accessing the vehicle underbody. When you’re uncomfortable, you’re more likely to make mistakes, and there’s nothing better than a car lift that lifts to the perfect height. The HD-9STX maximizes versatility in a car lift that adapts to your height and lifestyle. The narrow designs fits in the same floor space as the HD-9ST but requires a bit more ceiling height to fully enjoy.